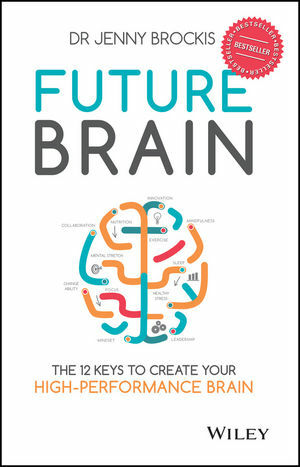 Future Brain is the busy professional's secret weapon for boosting mastery, efficiency, and productivity to gain that coveted competitive edge — in business and in life. Designed to be implemented at the individual, team, or organisational level, this in-depth, step-by-step framework leverages neuro-scientific principles to help you develop a solid, habit-changing plan for building and maintaining brain fitness and healthy behaviours. Author Dr. Jenny Brockis will help you develop your thought processes and your regular routine to get more done with less effort and time. Based on the idea of neuroplasticity, these daily practices improve focus, creativity, and effectiveness to help you stay relevant, competitive, and way ahead of the pack. You already have a magnificent brain, but you probably take it for granted; we often develop "survival techniques" that force our brain to work with an incompatible "operating system" in an effort to keep up with the ever-increasing velocity of change and information overload. This book helps you beef up your brain awareness so you can take advantage of the built-in features and native capabilities that make the human brain a truly awesome machine. DR JENNY BROCKIS is a medical practitioner, healthy brain advocate, and future mind planner. She is the director and founder of Brain Fit.